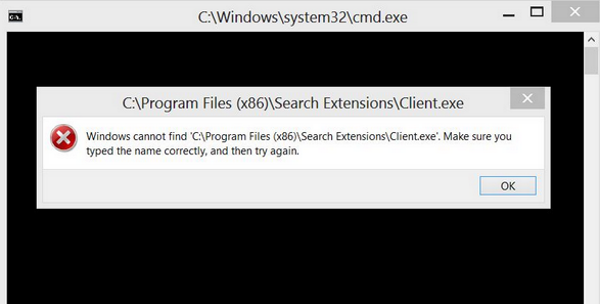 How to get rid of: "Windows cannot find 'C:\Program Files (x86)\Search Extensions\Client.exe'. Make sure you typed the name correctly, and then try again." error when you try to run Group Policy Editor? The problem most likely is that you have removed Client.exe file from your computer, but your system considers it is on it's place and still attempts to start the executable, because there's an autorun task that is attempting to start 'C:\Program Files (x86)\Folder_name\Client.exe'. However, since the file doesn't exist anymore on your computer, you get this error message and it won't stop until you remove all associated files and tasks. This particular file usually comes along with either adware or Potentially Unwanted Programs (PUP). A PUP (potentially unwanted program) is a program that may be unwanted, despite the possibility that user consented to download it. PUPs might include adware, spyware, or dialers, and are usually downloaded and installed along with a program that the user wants. To avoid PUPs, first, make sure that you choose safe web location where you want to download any software programs or updates. Second, read carefully installation instructions and End user licence agreements before installation. It is longer, but in the end it is worth your time. Third, use reliable anti-malware programs. According to our research this error is mostly caused by RocketTab adware. Here you will find complete and fastest solution for this problem - "Windows cannot find client.exe..."
Most frequently the problem appears in Windows during the startup. First of all, download and install SpyHunter anti-malware and run a full system scan. If you're getting a client.exe error message, it most likely means that you have already deleted the PUP extension or your antivirus program blocks it from execution. The anti-malware program will detect and remove this infection from your computer. Download and install Autoruns for Windows. This is a freeware software program and is recommended by Microsoft tech support engineers. Autoruns is built to show you the list of all startup explorer shell extensions, services, toolbars, browser helper objects, and Winlogon notifications. Open Programs and features in the Control panel. Look through the list of your application, locate any application, which you are sure was not installed by you and uninstall it. Launch autoruns.exe program. Scroll down the list of applications, or use Search option, to locate the entry which is related to Client.exe. Select the entry, right mouse button click it, and choose Delete from the drop down menu. Restart your computer and confirm that the error message is gone. Scan your computer again with anti-malware program to confirm that all PUPs have been removed. That's pretty much it. We hope this article helped you with your issue. Good luck.